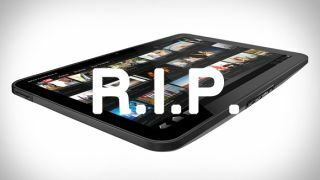 News arrived today that Motorola has settled a lawsuit over its "Xoom"-branded tablets and agreed to stop using the name. That shouldn't be too hard for the company, considering it hasn't released a Xoom tablet since 2011. The lawsuit was brought by by Xoom.com, an online payment processing company, in 2011, shortly after the release of the original Motorola Xoom. Google bought Motorola later that year, and the companies even released a Xoom 2 in December 2011, but it took until now for the matter to be settled. The terms of the deal between Motorola and Xoom were not and likely will never be disclosed, but word is both parties are satisfied, and Motorola won't release any more Xoom products. Clearly that's fine with Motorola, since the next big thing for the company is the Moto X. No doubt it's happy to move on. The big question going forward is, of course, when will Motorola re-enter the tablet game? Xoom is officially dead, and the Atrix line hasn't been seen or heard in years either. Is a Moto X tablet out of the question? We doubt it, but for now that's pure speculation. Don't miss TechRadar's hands-on review of the Motorola Xoom!